Chock full of nutrients this side dish is a very hearty addition to any meal. Inspired by a friend’s similar dish, we take a simple peasant dish and bring it back home. We prepare this using chicken stock but it can also be prepared with vegetable stock making it a wonderful vegetarian dish! 1. Parboil the potatoes until they show signs of becoming soft, do not cook too much! 2. Blanch rapini in well salted water, remove and set aside. Add some lemon juice. 3. In a large pot use 3-4 tbsp of olive oil and sauté the onions and garlic. 4. Once the onions begin to turn translucent add 1 cup of chicken stock. 5. When it comes to a boil add the beans and let simmer for 5-10 minutes. 6. 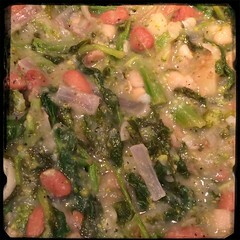 When the beans have simmered enough, toss in the blanched rapini and parboiled potatoes. 7. Let cook for 5-10 minutes adding in salt and pepper to taste.